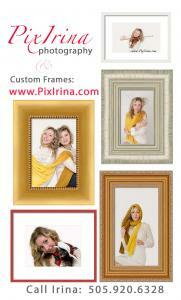 Your photographer PixIrina presents some beautiful frames available on market for your portraits. You want to trust your photographer for selecting the best frame for protecting your portrait and making the piece of art out of it altogether. But you are welcome to spend some time on your desktop computer and shop for media, framing and matting of your portrait on www.pixirina.com. Thank you for your purchase of a print. Your media is Luster photo paper, rolled in tube. It is always a good idea to have your print safe in mat and in a frame as print easily could be damaged. - Unpack your tube on a flat, sturdy surface. - Prepare your frame. As your print may arrive in not a traditional size (eg. 4x6, 10x8), I suggest you to shop for a floating frame with acrylic glass. - Always wash your hands before touching a print and if possible wear clean white cotton gloves that are designed for handling art. Cotton gloves are excellent for handling prints as they prevent fingerprints and marks caused by fingernails. Avoid touching the printed surface if you can and generally try to handle the print by the border or edges. Print longevity can be affected by moisture and acid in your skin. - When picking up a photograph always use both hands and for larger prints make sure they are supported at the back so that they does not bend or kink under their own weight. - Avoid getting saliva on the print surface as it can also cause long-term damage. Even as you talk very small amounts of saliva can end up on the surface of the print. If you are trying to blow something off the surface then make sure you do not accidentally spit on the print. - Make sure you take your prints to a framer who has experience handling fine-art photographic prints and understands good archival framing. If they are not experienced, make sure that you stress to them the importance of proper handling and framing and make sure they know the value of your artwork so they will take extra care in framing and use materials and techniques suitable for conservation. - Hang your portrait and enjoy! Recycle Santa Fe Art Festival organizers invited PixIrina to photograph models and their costumes made out of recycle materials. The Trash Fashion Show and Costume Contest 2015, was one of the favorite events of the country�s largest and oldest recycled art market, was held in Santa Fe Conventional Center on Friday, November 20, 2015. I set up a portable photography studio and had a line of a beautiful models in a different age groups: from Children to Adults. 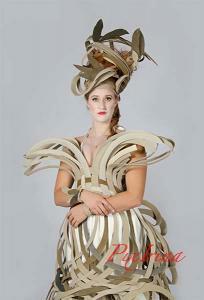 I enjoyed photographing gorgeous models, presenting recycled materials clothing created by talented designers. If you wish to own a digital file, please contact me.